The renovated bakery with its authentic bread oven. Property of the nineteenth century, renovated identically and classified by the Heritage Foundation. Ground floor: living room with kitchenette (MW) and small sitting area (TV). 1st floor: 1 attic room with 1 bed 140, bathroom and toilet. Garden with garden furniture, deck chairs ... Laundry room (LL). Most: the beds are made on arrival. Well-being area with dry heat sauna massage chair, heated pool. Table d'hôtes on reservation. Nearby: hitch hiking (Ferme du Cheval Rouge). 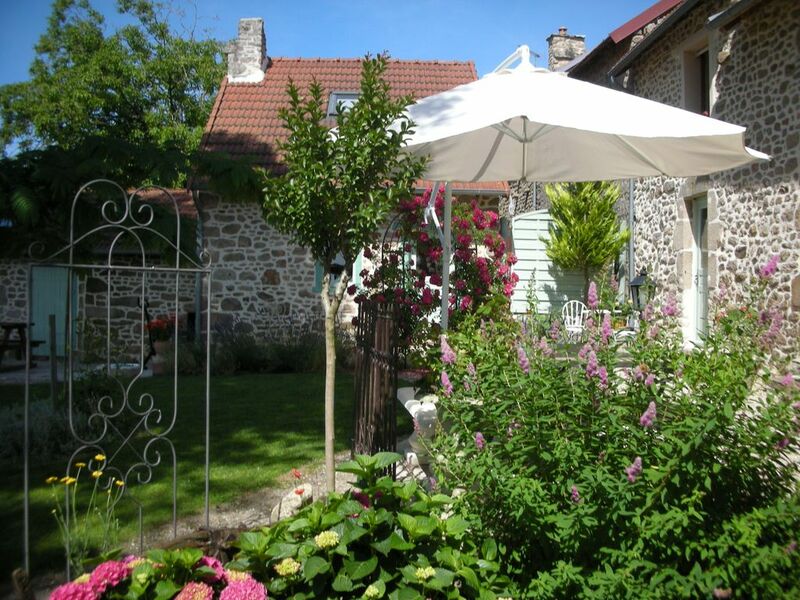 The owner offers themed weekends: weekend well-being, pedestrian (in the footsteps of impressionist painters in Crozant / Fresselines and George Sand) ... Need to rest? With family or friends, come and relax at the Maison du Tisserand. Throughout your stay you can enjoy the heated outdoor swimming pool (free access) and the wellness area: spa and sauna (on reservation). Capacity to accommodate Total 12/13 people. The 2 cottages can accommodate 8 people, 6 adults 2 children. A Beautiful property fitted out to 5 star quality. Everything needed for self catering included. Lovely accommodation in delightful rural hamlet. Jean Pierre was a lovely man who couldn't do enough for us! We arrived late through Channel tunnel delays and were unable to inform Jean Pierre, the owner. As he wasn't there he asked a friend to greet us upon a rival. Jasmine not only greeted us bought, welcomed us both with a beer, helped with the luggage, then took us shopping. Jean Pierre himself is a lovely man and every day asked if there was anything we needed. Shame about the weather!! Endroit magnifique, Jean Pierre est très accueillant, nous garderons vraiment un super souvenir de ces quelques jours dans ce gite chaleureux. Sehr hübscher Garten, schöne Unterkunft und ein sehr hilfsbereiter Vermieter! Wir haben uns bei Jean-Pierre sehr gut erholt und auch das Baden im Pool mit Weideblick sehr genossen. Wir hatten das Ferienhaus. Es ist winzig, aber liebevoll mit allem Nötigen ausgestattet. Der Garten wird von allen Urlaubern gemeinsam genutzt. Es gibt verschiedenen Sitz-Ecken und natürlich die Liegestühle am Pool. Baden mit Blick auf die Kühe!! Unbeschreiblich schön! Die Häuser liegen in einem kleinen Dorf, etwas weit ab 'vom Schuss', dafür aber ruhig. Jean-Pierre macht alles möglich. Table dHôtes ist im Sommer eigentlich nicht vorgesehen. Auf unsere Nachfrage hat er uns zum Essen eingeladen (!) und vorzüglich gekocht. Wir kommen gerne wieder.